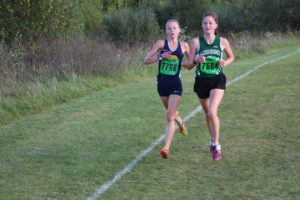 Clarkston runners continue to dominate the league as they finished in first place in the second OAA Red Jamboree at Lake Orion, Sept. 25. The Clarkston Girls Cross Country varsity runners finished in first place with 29 points and the boys won their race with 42 points. “We ran very well for our first time all together,” added Larry Adams, boys coach. Grace Nolan led the girls, finishing in first place at 19:07.4. Elizabeth Dalrymple finished in fifth place at 20:19.2; Mattie Drennan, sixth, 20:22.5; Emily Ferguson, eighth, 20:35.7; Elyse Wilhelm, ninth, 20:49.9; Shannon Billette, 26th, 21:55.1; and Ashleigh Strong, 35th, 22:24.6. Lake Orion finished in second place with 44 points; Troy, third, 67; Oxford, fourth, 84; Birmingham Seaholm, fifth, 125; and Rochester Adams, sixth, 135. Nathan Sesti led the boys as he finished in third place at 16:35.1. The top seven runners for the Wolves also included Brendan Favazza, fourth, 16:41.3; Shawn Slater, 16:44.8; Mark Sprague, 14th, 17:55.1; Christian Collis, 16th, 18:02.1; Jeremy Cavallo, 22nd, 18:17.4; and Carson Brock, 27th, 18:26.5. Troy and Oxford tied for second place, both with 76 points; Lake Orion, fourth, 91; Seaholm, fifth, 99; and Rochester Adams, sixth, 131. The final league race is at Clintonwood Park, Oct. 18. Both teams finished in first place at the Waterford Mott Fall Classic on Friday, both scoring 28 points. The top five runners for the boys varsity race were Favazza, first, 15:44.4; Sesti, fourth, 16:33.3; Slater, fifth, 16:36.2; Sprague, seventh, 16:58.2; and Collis, 12th, 17:11.7. The top five runners for the girls varsity race were Mia Patria, third, 19:22.5; Dalrymple, fourth, 19:40.2; Mallory Ferguson, sixth, 19:56.4; Drenna, eighth, 20:01.5; Nolan, tenth, 20:09.8; and Emily Ferguson, 11th, 20:14.8. The Wolves prepare for the Oakland County Meet this Saturday at Kensington Metropark in Milford. “Hopefully if everyone remains healthy we can make a run for it this year,” Breen said, adding the girls hadn’t won it since the early 2000s but have finished as runner-up.